All living things sense and respond to their environment. How do living things sense and respond to their environment? What does using my senses in nature look, sound, feel, taste and smell like? How do my senses compare to the senses of other plants and animals? How is sensing and responding related to interdependence within ecosystems? How will teachers and their students reflect on and evaluate the completed project? 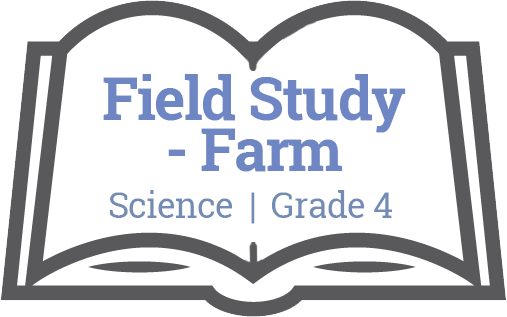 What aspects of the field study went well? What did students struggle with? What did you struggle with? What would you add/revise the next time you taught this field study? What connections can I make back to my school learning community?e.g. Create a plan of action to address a chosen (environmental) problem or issue (SS 4). 1. What is a farm? What role does a farm have? What are domestic versus wild animals? 2. What are some questions you have about farms and the animals that live there? 1. What is a farm? 2. How did I notice (observe) the senses of the farm animals? 3. What did I notice (observe) in this field study? 4. How do goats, pigs and chickens sense and respond to their environment? 5. What are the basic needs of these animals? 6. What questions do I still have about these animals that live in the farm? What is a GRASPS task? making observations about the farm animals and describing unique features about each animals and describing what role those features may have. The following resources are made available through the British Columbia Ministry of Education. For more information, please visit BC’s New Curriculum. The Big Ideas consist of generalizations and principles and the key concepts important in an area of learning. The Big Ideas represent what students will understand at the completion of the curriculum for their grade. They are intended to endure beyond a single grade and contribute to future understanding. Curricular Competencies are the skills, strategies, and processes that students develop over time. They reflect the “Do” in the Know-Do-Understand model of curriculum. The Curricular Competencies are built on the thinking, communicating, and personal and social competencies relevant to disciplines that make up an area of learning. To read more about First People’s Principles of Learning, please click here. For classroom resources, please visit the First Nations Education Steering Committee.